1. Lay the newspaper inside the t-shirt. This will prevent your design soaking through to the other side of the fabric. 2. Grab your pens and draw! Or even write a message or joke. 3. Follow the instructions for setting the ink - usually running an iron over it, perhaps with a tea towel. Who doesn't love a chocolate truffle? We all do for sure. The other day we nipped into Morrisons for a few bits and Mini said that he'd liked to make something for the NC and I - all on his own. After frantically thinking about something that he was old enough to do by himself, that I could actually eat (on soft foods only at the moment), I recalled watching Hope and Greenwood on Friday night making truffles, ah - perfect. So we picked up a pot of cream, and a few bars of chocolate, and headed home (though on the proviso that I would help with the hob job of melting chocolate). 1. Put a bowl on top of a saucepan of boiling water. Make sure it doesn't touch the water. Break the chocolate and put it in the bowl with the cream and butter. 2. Let it all melt together, stirring every now and again. Mummy says this is called gan-ash. 4. Once it's hard, take it out of the fridge and let it get a bit warm - mummy said it took about 30mins. 5. 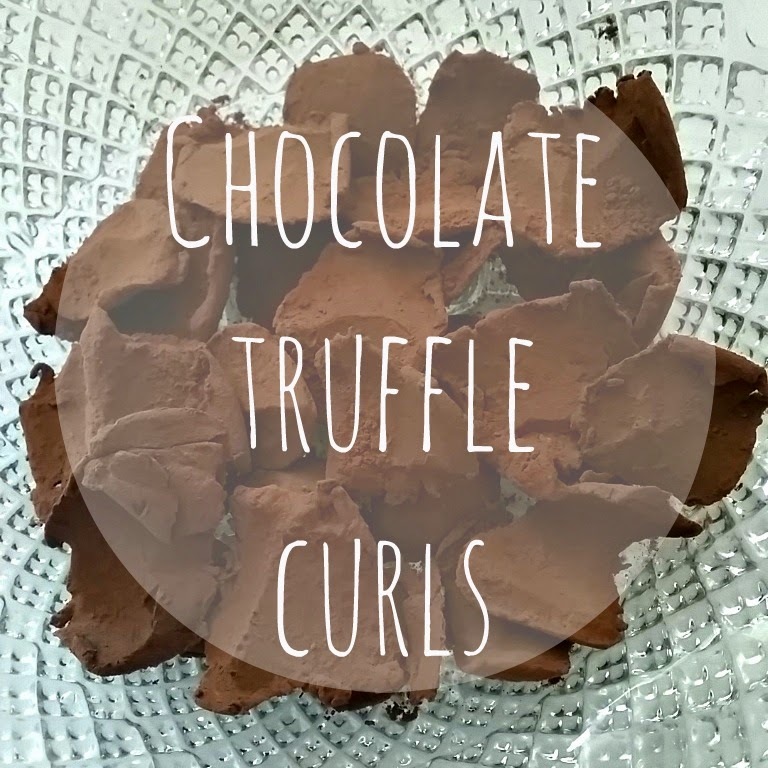 It should be soft enough to use a little spoon to scrape thick curls of chocolate stuff, and drop them gently into some cocoa powder. Use a spoon to cover them in cocoa then carefully put them on a plate. Mummy said truffles are normally round but I don't like getting my hands too mucky so we didn't do that. 6. Keep them in the fridge and eat when you want! I reserved some of the ganache and added a pinch of seasalt, 2 capfuls of gin and some freshly squeezed lime juice. It set softer than Mini's gananche but was still enough to make very soft truffles (and they're gorgeous!). Who doesn't love a bit of sticking and gluing? 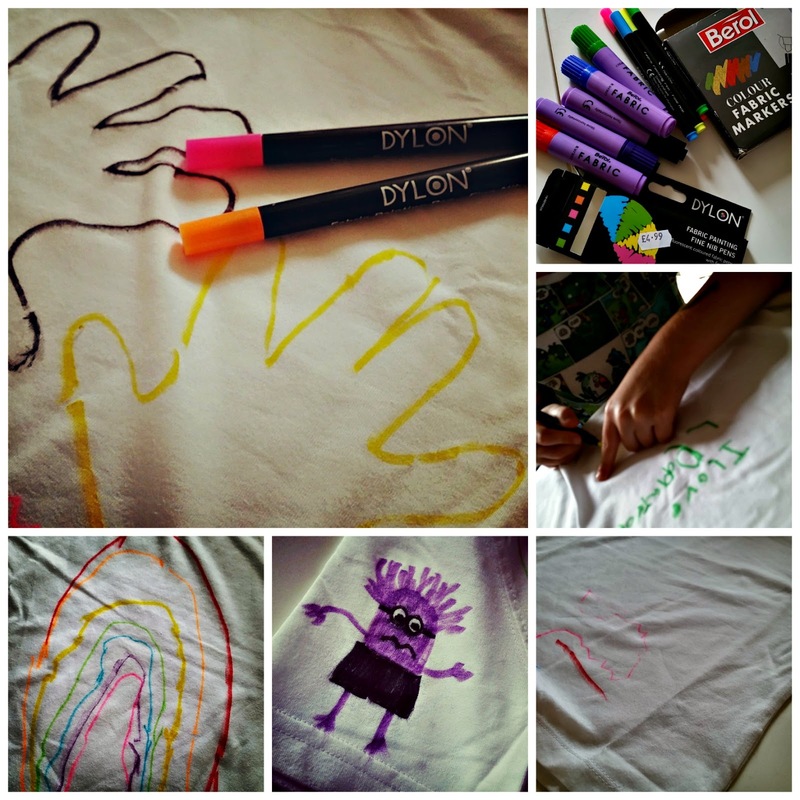 My kids often want to get the coloured paper out, a pritt stick and some random slips of paper. As most of you know, we live not too far from the beach. We visit A LOT. Our favourite part of the beach we go to, has some sand - certainly enough to dig and build sandcastles, but is also very stony, with lots of pebbles, a fair sprinkling of shells, and a little bit of sea glass hiding between the pebbles. Another part of the beach is particularly good for driftwood, and we've collected plenty in our time. So much in fact that Mini and I upcycled a plain boring wooden framed mirror by gluing driftwood to the edges, it now sits in our living room and is admired by many. During our visits over the last few months I've been nagging the children to collect stones and shells with holes in - and they've dutifully dug, picked and discarded appropriate beach 'memorabilia'. 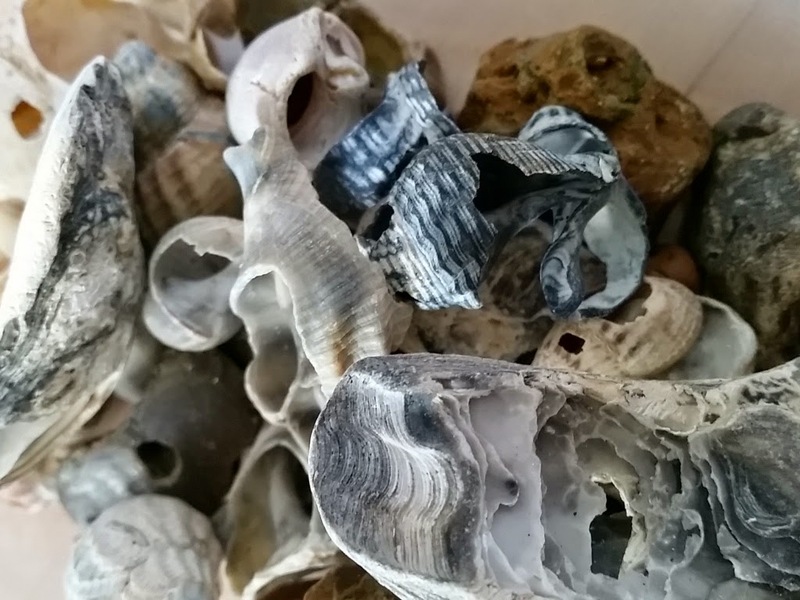 (The good shells and stones made it into buckets, pockets and shoes, and in turn across the boot of the car, the washing machine and the shoe rack but nevermind!) 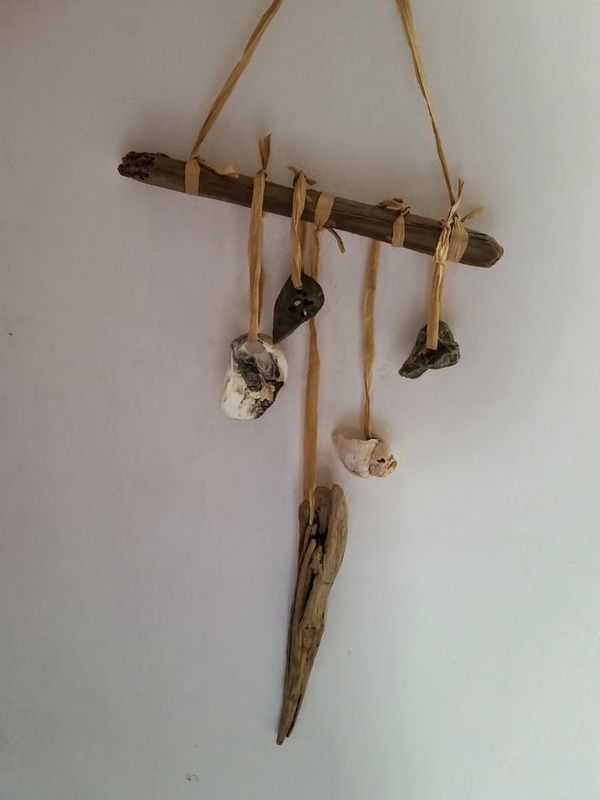 The purpose of these holey stones was to make a hanging with some of the leftover driftwood, as a reminder of our beach trips and as a summer craft for both fun and encouraging fine motor skills and patience through threading. 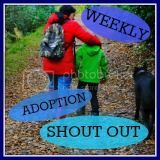 And I was pleased to see that Crafts on Sea has shared a very very similar craft on her guest post for this week's #SummerSandpit on The Adoption Social. We love them - we have one hanging in the window, and one hanging halfway up the stairs and they're just so simple to make. 1. 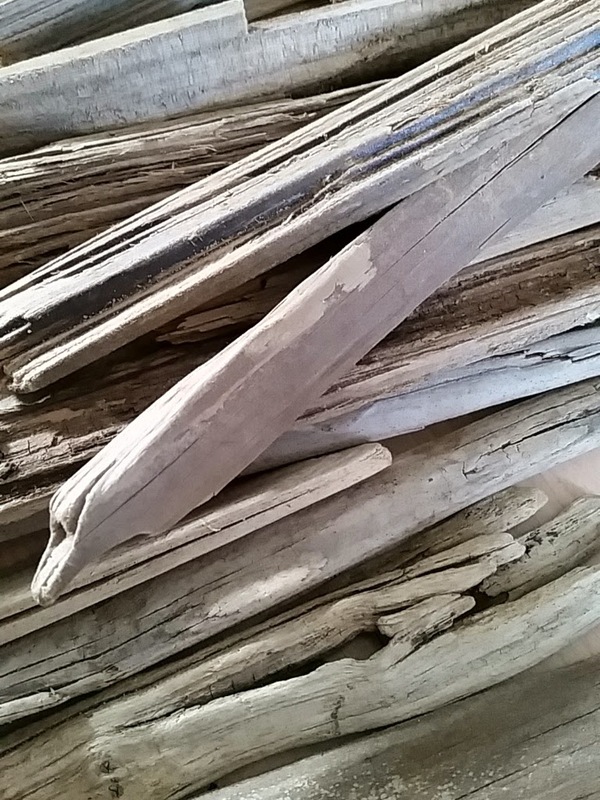 Cut the raffia/ribbon about 2-3 times the length of your driftwood. Tie this on each end, with a double knot to secure. 2. Using different lengths of raffia/ribbon, tie on shells/stones/short driftwood - as many or as few as you like. We found that odd numbers looked best. Hang wherever you like! Oyster shells look really pretty and are often damaged with holes in. If you struggle to find natural holes, you could always carefully drill holes in driftwood. If you have a good twine then these could stand up to outdoor use as a windchime. Now we're in the swing of the holidays, and we've had a super busy week - a trip to Great Nan H on Tuesday, and a surprise (to us anyway) meet up with my uncle, aunt and cousin who've been on holiday. We went out for lunch in a strange (to the kids) town, in a pub that even I've never been to, but the kids were strangely relaxed with their Great Nan, and pleased to see my little cousin who is just a year older than Mini. They were angels ALL DAY! Nan gave them a surprise fiver each, and I made a surprise trip to a big toy shop on the way home, and so there were big smiles. It was a long day, we hit heavy traffic on the way home, which made the usual hour's drive even longer, but both Mini and Dollop were so well behaved, and didn't complain a bit. On Wednesday we had another busy day with Daddy who'd taken a couple of days off work. So first a game of ten pin bowling (Mini didn't win but he didn't tantrum either), then strawberry picking, out for lunch, onto a garden centre and pet store, and then into our local town for coffee and a bit of birthday present shopping. Several of those could have triggered a meltdown, but we only had one low point, and it blew over very quickly. Thursday was a day out in London. 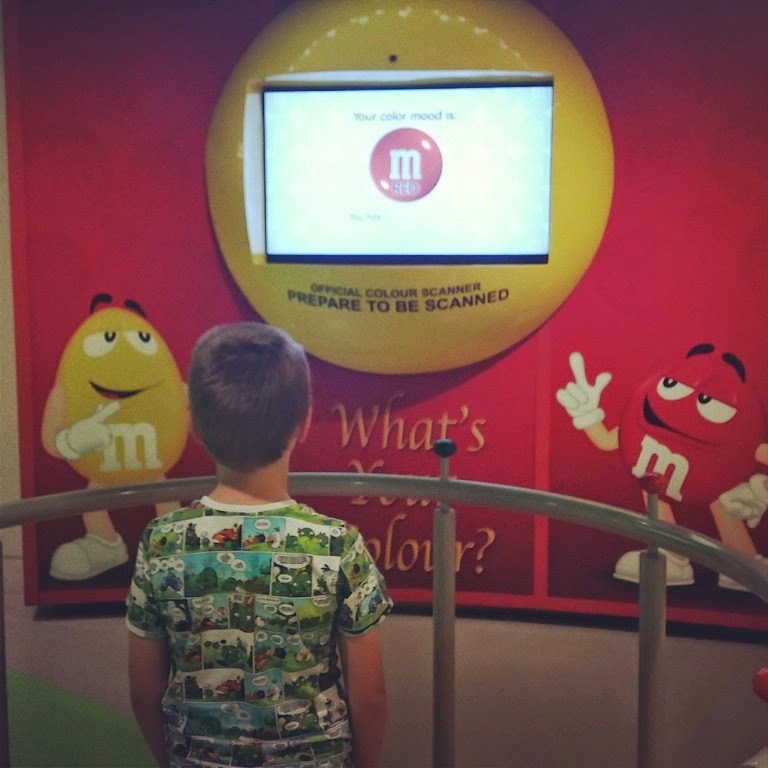 We'd talked about where we were going to go, but on the drive down both children made it very clear that they'd rather go to the M&M Store than the Natural History Museum. And I really wanted them to visit Hamleys. So, a last minute change of plan meant Leicester Square, lunch off Covent Garden, up past Trafalgar Square, past the Trocadero, to Piccadilly Circus - a quick snap in front of Eros, then we headed up to Fortnum & Masons, over to Regents Street for Hamleys (the best toy shop ever! - Mini), and then through to Carnaby Street and a drink/cake break at Choccywoccydoodah. 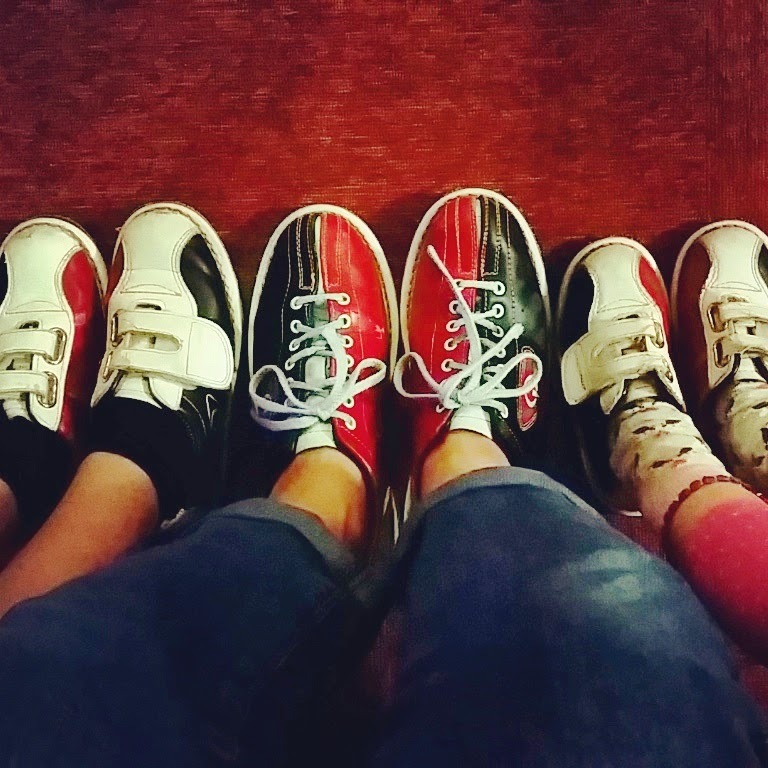 We had some concerns about London, as it's only the second time we've taken the kids, but we went to some new places, and some that we saw last time, and I think because we walked around (rather than using the underground) the kids were more at home. Mini had recognised - before we left home - that the tube worried him and asked for us to take the Rescue Remedy gummy stars, he asked for them just 3 times - just before we got on the tube into London, whilst we were on it, and then again on the tube back out of London. We were thrilled that he recognised this fear, talked to us about it, and came up with something that would help him. We were a little apprehensive that Hamleys might overwhelm Mini (and little Dollop come to that) but they took it all in their stride and actually really enjoyed seeing all the demonstrations, looking round the different floors, trying out some of the toys and choosing something to bring home. And we were complimented by the staff in Fortnum & Masons on our 'exceptionally well-behaved children' - you can imagine how thrilled the NC and I were to hear that. Biggest grin ever and lots of praise to the little people! Thank you to that man for making my day! We had a day at home to rest, then headed out yesterday to visit my other grandmother - Great Nannie B. Again, we were surprised by my aunt and uncle also visiting, and the kids were very much at home, playing inside and out, kind, polite, pleasant and engaged really well with everyone - no hint of shyness, just comfortable ease. We'd planned to come straight home, but the kids had been so well-behaved, we took them to nearby Southend on Sea for chips and an icecream. In case you didn't know - the chips in Southend are the best, and Rossi's icecream is far superior to any other I've ever had. And despite the long day, again we had brilliantly behaved children - calm, relaxed and just a pleasure to be around. Of course, it couldn't have ever lasted and today has been hard work. Mini is definitely becoming more relaxed when we visit people and places - less of the worry about moving on, but it's still there a little, so we got a bit of pay back today. But, nothing that we couldn't handle therapeutically, and with a bit of one to one time. Today in fact, it's been Dollop who has been the hyper little whirlwind, tumbling around all over the show, needing attention, putting on dance shows and singing constantly! I'm really pleased and proud of the children this last week. It's been tiring, it's been busy. In fact, my aunt commented that she doesn't know anyone else who does so much with their children - it's true, we keep busy, but it helps keep the meltdowns at bay; hopefully ensures Mini feels a sense of safety, togetherness, family and security; tires out the children so they sleep reasonably well (at least Dollop does), and it gives them new experiences. Isn't that what parenting is all about? My kids LOVE being outdoors. We have a very long garden, and they are as happy up the top with the bubble machine on as they are down the bottom on the trampoline. We have missing fencing that needs replacing and we just can't afford to right now. The only window that overlooks the garden is our bedroom - and that means I can't always see the kids outside. Our seating/dining area is covered in rubbish that needs to go to the tip, but won't fit in our car. The long flower bed that stretches halfway down the garden is full of weeds, that no matter how much I pull out, they are back within a few days, and my beautiful hostas have been well and truly nibbled by snails this year. Our veg patch has been completely neglected since Dollop was born, and is now a cultivation site for bindweed and dandelions, and a pile of ash from our recent bonfires. We do have good points about our garden too - It's super long and narrow, and that means there is enough space for an enormous outdoor run for the guinea pigs, a big trampoline for the kids, a reasonable shed, a roundybouty twirly washing line, a sand/water table, a good sized seating/dining area, and a fair size veg patch. Plus, plenty of room still for the kids to run, scoot and ride their bikes. Almost all our fencing is 4 foot or lower, which means we get to chat with our neighbours in the gardens, and Mini gets to play football with the lad next door. But the best thing about our garden is the greengage tree at the bottom. And today in fact I've been making jam with it's tender, juicy offerings. Until this weekend, the greengage tree was neglected, the space beneath it left to go wild in the hope of encouraging wildlife into the garden, two old Christmas trees propped up, hoping to entice ladybirds and little beasties to nest - in truth, we've had a few snails that look pretty, and a whole host of spiders, but not the ladybirds, butterflies and moths that I would have liked, and because of the shade from the overhanging branches, none of the flowering plants that I've put in have survived. But this weekend, Mini and I have had a brilliant time, cutting back branches, shaking off the ripe fruits, hacking back the long grass, digging down to pull big roots up, watching spiders, woodlice, earwigs and snails scuttling along (well, the snails were s-l-o-w-l-y sliding), and finding hidden treasure (broken pottery) in the soil. 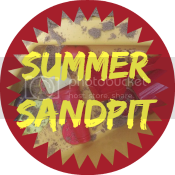 When I first started thinking about a post on nature for Summer Sandpit, I had intended to write about some of the nature-based crafts we've done - the beach themed hanging or the cress and basil terracotta planters (and I might still share those too). But this outdoor time has been a really good time for Mini and I. I might be a little achy from all the digging, picking and cutting, but we've spent really good quality time together, laughed together and worked together at reclaiming a patch of land that we're planning to use together.